Chop the bad guys' heads off and TAKE THEIR STUFF! Axe Cop is the hit webcomic written by Malachai Nicolle (age 5) and drawn by his brother Ethan (age 29). With his friends Dinosaur Soldier and Sockarang, Axe Cop fights crime! He hunts down the bad guys (like Giant Robot Zombie, Vampire Man Baby Kid, and Dr. Stinky Head) and CHOPS THEIR HEADS OFF. Just don't get blood on you, or you might turn into something totally different, like Bat Warthog Man or Avocado Soldier. There's only one game that can match the anything-goes action of Axe Cop – and it's Munchkin. 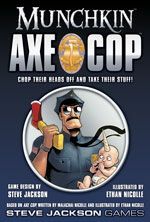 So clearly we had to bring you... Munchkin Axe Cop. Using original art from the series (and a few brand-new pieces by Ethan Nicolle), this game drops you into the world of Axe Cop.